Classic Movie Night – Featuring Smokey And The Bandit! The Iowa 80 Trucking Museum will be hosting a Classic Movie Night. 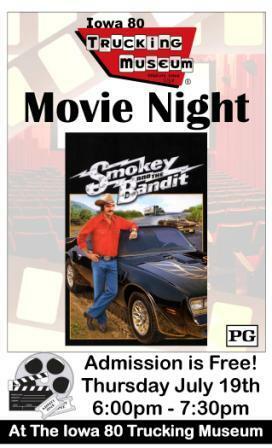 Smokey and The Bandit will be playing in the REO Theatre on Thursday, July 19th at 6:00 p.m. Admission to this event is FREE, and popcorn is included! Bandit and Cledus are two truck-driving southerners who accept a dare from big-shots Big and Little Enos to pick up a truckload of beer from Texas and return it to them within a specified amount of time. Picking it up is simple enough, but as they are leaving Texas, Bandit unwittingly picks up Carrie, a hitchhiking bride-to-be who just left her groom, Junior, at the altar. Junior, however, is the son of Sheriff Buford T. Justice. And when Buford and Junior discover what has happened, they go on a “high-speed pursuit” across the Southeast to catch the bandit.